Their concerts accentuate the connection between communities and generations with a light-hearted depth that delights and promotes a joy. Their recordings have garnered invitations to perform in Amsterdam, England and throughout the United States in festivals, synagogues, churches and community centers. Ira and Julia perform as a duo or with their world folk ensemble as heard on their first CD*: 36, inspired by the legend of the silent saints who keep the world in balance with their selfless benevolence; and again on their second release My Friend Hafiz, renderings of the poetry of the 14th century Sufi Master (as translated by Daniel Ladinsky). Their recordings bring a message of universal love and divine compassion to the listener, emphasizing the common thread between spiritual communities. In addition, their diverse musical and story repertoire extends from children’s music to American Songbook offering the opportunity to bring generations and communities together in celebration. Ira and Julia have had solo and separate music careers. Ira Levin is also known as Uncle Eye (as seen on PBS Kids!) and Julia has just ended a nine year tenure with internationally-acclaimed a cappella women’s quartet, Vocolot. Their dedication to making the world a happier place through music, together, has led them to relocate to New York, but remain bicoastal visiting their northern California communities, especially in winter! PROGRAM OPTIONS: All programs can be inclusive of community choirs or geared towards current curriculum / holiday. The Levins’ Family Concert: Join singing-storytellers, Ira and Julia Levin, sharing the joy of Jewish wisdom through interactive stories and songs. Presenting funny and poignant midrash from the Torah, legends and fairytales along with original and popular songs to engage children ages 4 to 10 years old. Captain Tree and the Source of Creation! 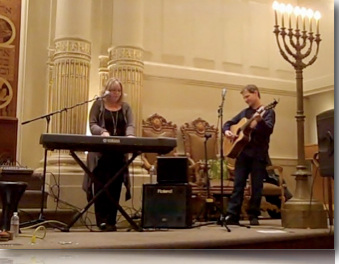 Inspired by the the desire to recognize the common thread between spiritual communities, The Levins share a concert of song and story honoring the melodic and mystic connections between faiths. A divine mystic mash-up of traditional melodies and The Levins releases,“36” and “My Friend Hafiz”, celebrating the Lamed Vavniks, Kabbalists, sacred Jewish texts/concepts as well as the inspiring words of post-Rumi 14th century Sufi poet, Hafiz of Shiraz ( as translated by Daniel Ladinsky). A great opportunity for Ira and Julia to work with your choirs and to extend the invitation to the interfaith community, resulting in concert and celebration. 4The Levins World Folk Ensemble: The musical concert combining western and middle eastern traditions, rhythms, and poetic inspiration. Uplifting acoustic world folk with beautiful vocal harmonies inspired by the Sufi poetry of 14th century Persian mystic Hafiz of Shiraz as translated by Daniel Ladinsky in his book “The Gift” as well as traditional and original Jewish Mystic music. Ira and Julia are joined by middle eastern percussion and cello.